Get The Internet Analyst in your inbox every day. To sign up, please submit your name and email address here. 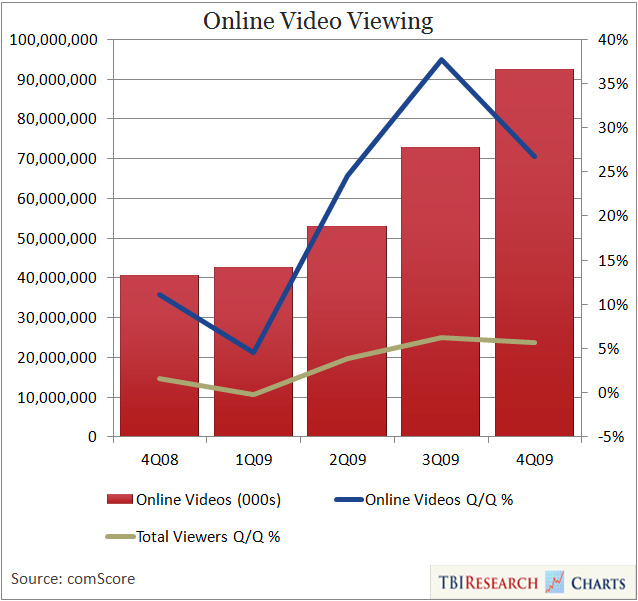 Online video viewing more than doubled in 2009 as more quality content was distributed online and users continued to watch online video in increasing numbers. Viewing/Sellout increases are driving much of the industry’s growth, alongside modest rate increases. YouTube is selling more inventory and receiving double-digit pre-roll CPMs. Entertainment advertisers continue to lead spending on the category, but other categories are starting to spend more too. Click-through-rates remain much higher than display and continue to improve. The strong performance so far this year is good news for publishers with significant exposure to video. In particular, Google, through its ownership of YouTube stands to capture a lot of this growth. Online video views grew about 30% in Q409 and are trending at a similar pace in Q110. This, combined with increased sell-out rates, is driving much of the growth in online video advertising this quarter. Still, online video rates have not experienced the downward pressure that is currently impacting display. We estimate online video CPMs are up in the mid-single-digit range this quarter. Run-of-network pre-roll inventory is generating $10 to $15 CPMs. Overlays are around $8 to $10 CPMs. In addition, the company is receiving CPMs of between $5 and $6 on its homepage leaderboard banner ad with daily buys that can range from $200K to $300K. It’s very difficult to estimate the sell-out rate for YouTube’s inventory since this information is tightly held and the amount of inventory significantly increases each month as the audience grows. 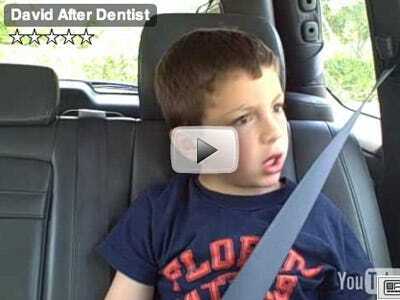 However, we estimate the company is selling ads against anywhere from 30% to 40% of its most popular videos. We expect this sell-out rate to increase throughout the year, driving revenue growth at the company and the overall online video category. Entertainment was one of the earliest advertisers to adopt online video and continues to be a leading spender. We estimate entertainment spend is on pace to increase upwards of 60% this quarter versus 30% to 50% for overall online video. Advertisers that remain especially active so far in 2010 include the major studios (Sony Pictures and Warner Brothers in particular), and gaming companies like Electronic Arts and XBox. Other categories that are spending more on online video this year and are buying more inventory include Technology, Retail, and Consumer Packaged Goods (CPG). We have heard anecdotal evidence that CTR for display has decreased over the past year (as much as 15% according to our estimates). However, video continues to generate CTR that are significantly higher than display. Display is currently averaging below a 0.2% CTR according to industry estimates, but video CTR is exceeding 1% on average. We estimate this is about 20% higher than in 2009. 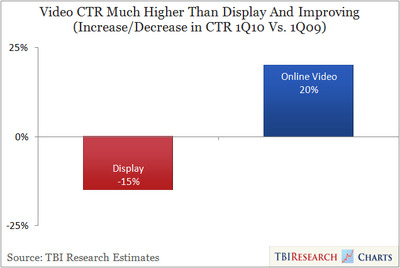 Why the higher CTR 1) versus last year and 2) versus display? Most executives we spoke with cited better creatives than versus a year ago, when many online video ads were still essentially TV ads played online. In addition, the higher CTR for video versus display appear to be a combination of “display fatigue” on the part of consumers who have been inundated with display ads for years, and the fact that many online video ads are more engaging than display ads. Many publishers do not emphasise the higher CTR since video advertisers primarily run branding campaigns meant to drive purchase “intent,” which can not be measured by how many viewers click through the ads. Still, we believe continued CTR improvement should drive further CPM increases for video advertising since, at this stage, most online advertisers still place significant importance on measurable ROI even for branding campaigns.